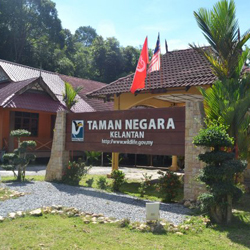 The name Taman Negara (National Park) is synonymous with birdwatching in Peninsular Malaysia. Kuala Koh is the gateway to the northern section of Taman Negara (the other gateways being Kuala Tahan as well as Sungai Relau in Pahang and Tanjung Mentong in Terengganu). Its access is situated about 90km from Gua Musang town. It is about 290 km from Kuala Lumpur and 185 km from the state capital Kota Bharu. This pristine hill and lowland forest covers an area of 835sqkm, offering birdwatchers glimpses of over 300 bird species. Access to this site is via Gua Musang. There is public transport by express and normal coaches or you can opt for the speedier and recommended mode of transport i.e. rental car. Banded Kingfisher, Great Argus, Large Wren-babbler, Crested Fireback, Garnet Pitta, Scarlet-rumped Trogon, Raffles Malkoha, Buff-necked Woodpecker, Black-and-yellow Broadbill, Greater racquet-tailed Drongo, Chestnut-winged Babbler, White-rumped Shama, Asian Fairy Bluebird.